Fiserv is an established leader in banking technology and related services. First Data is similarly positioned as a leader, with a greater emphasis on payments and specifically, card issuing and acquiring for banks as well as merchants - note its acquisitions of CardConnect and Bluepay in the latter category. While Fiserv’s core banking platform and payments clients trend toward smaller banks and credit unions, First Data has a diversified client base ranging from some of the country’s largest banks to very small financial institutions (through its reseller relationships). In theory this creates attractive synergy opportunities, enabling both parties to cross-sell into the other’s base. The combined organization has also promised $900 million of expense savings through the elimination of redundancies. This latter commitment highlights Fiserv’s challenge. Realizing such cost savings will likely require extensive platform rationalization and integration. First Data operates multiple processing platforms in the United States alone, and Fiserv already faces the challenge of integrating the debit processing and MoneyPass network businesses it acquired from US Bank’s Elan unit last fall. System integrations require virtual armies of resources, both internally and from clients who may need to migrate from impacted platforms. Fiserv has committed to substantial innovation spending by the go-forward entity. Nonetheless, it’s easy to see stalled product development while they harmonize existing projects, putting clients at a disadvantage relative to competitors working with other processors. It will be interesting to watch how large clients react to these conversions and other associated headaches. Some may look to contractual remedies and/or exit provisions for leverage if they are unhappy with the direction. It will come as no surprise to see Fiserv in the near term focus its client outreach on large financial institutions. 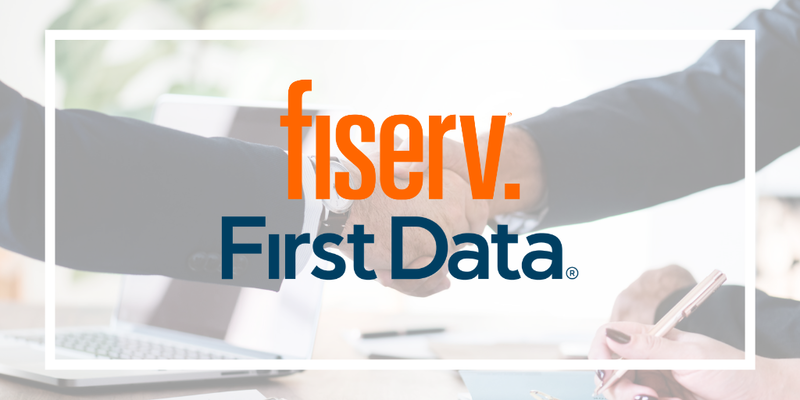 Both Fiserv and First Data have established a variety of VAR (Value Added Reseller) relationships to extend their reach to smaller clients. These clients may need to wait longer for answers, even if they contrast directly with the parent firms, and in many cases the VARs themselves may lack satisfactory answers. Channel conflict is a common concern in VAR relationships; however in this situation the issues are multiplied. Several First Data VARs compete head-to-head with Fiserv offerings. These conflicts will certainly be resolved over time, probably through the termination of certain partnerships, the migration of clients off some platforms, and potentially further consolidation. Unfortunately, the smaller the financial institution the less leverage it will likely possess to influence the timing and outcome of these transitions, making their vendor management efforts more challenging. More Industry Moves on the Horizon? Major mergers like these have a tendency to trigger a sequence of market responses. For instance, Fiserv’s competitor FIS may determine that it needs to match its rival’s newfound scale and payments capabilities. Rumors of an FIS/TSYS combination made the rounds in 2017 but amounted to nothing. Don’t be surprised to hear such conjecture heat up again. The Bottom Line: None of these effects will be noticeable immediately. The Fiserv/First Data transaction won’t be finalized for several months, a period of internal planning and shuffling will likely follow its closing. It is a complex business arrangement with numerous intertwined parts, and financial institution clients of both companies, large and small, should watch closely for signs of long-term impact and retain the flexibility to respond as needed.